This was a very nice baby pattern I found in the Just CrossStitch Magazine. It is not overly babyish and can be cherished by the child and parents for many years to come. I have done this twice now. 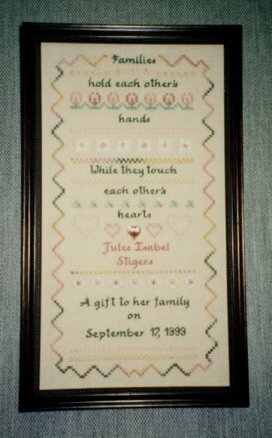 I did the first one for Jules Stigers, daughter of a friend and coworker, born September 17, 1999. 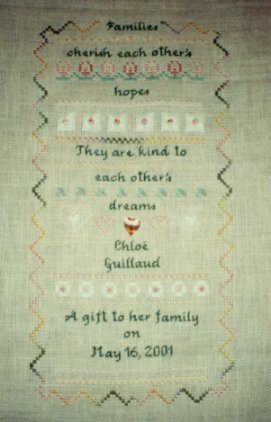 I did the second one for Chloé Guillaud, daughter of my French friends , born on her mother's birthday, May 16, 2001. I used the words from the "A Gift for a Boy" pattern since the wording was interchangeable. After years of trying, Chris and Holly, who went on a Disney Cruise with us in December of 1998, were finally blessed with a little baby boy. 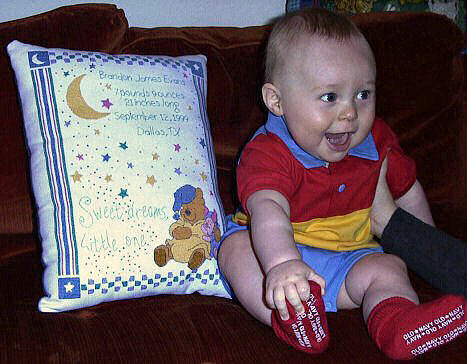 Brandon was born on my birthday, Septemeber 12, 1999. This piece seemed a nice way to commemorate the occaision (although I had already anticipated the blessed event and bought the pattern before the cruise was ever scheduled). I thought I might try something a little different with the finishing of this piece. I made it into a pillow (the first and last time I will ever do that) using a light blue denim piece of fabric for the back. And, just in case anyone is interested, those curved needles work wonders when you have to repair a loose thread after finishing!